If you needed more proof that the weed industry was thriving, look no further than the fact that, if legalized, weed would outsell ice cream. These days, it’s another kind of treat that is making bank, all year round. If you needed more proof that the weed industry was thriving, look no further than the fact that, if the government legalized it nationally, weed would outsell ice cream. That information comes from a new report by Marijuana Business Daily, which estimates that the total demand for cannabis – that also includes the black market – is between $45 to $50 billion. Annually, ice cream sales are only $5.1 billion, but the grand total of recreational cannabis sales in the United States would easily top that. In fact, it would also trump the total of cinema ticket sales ($11.1 billion) and snack foods such as Doritos, Cheeto, and Funyuns ($4.9 billion). It means, at that rate, it wouldn’t take long to also eclipse the sales of cigarette and, yes, even beer sales – potentially, anyway. As it is, the legal sales of recreational and medical cannabis in 2016 were $4 to $4.5 billion, which beats paid music streaming services (the latter sit at $2.5 billion). But what about that other favorite post-smoke treat that are Girl Scout cookies? 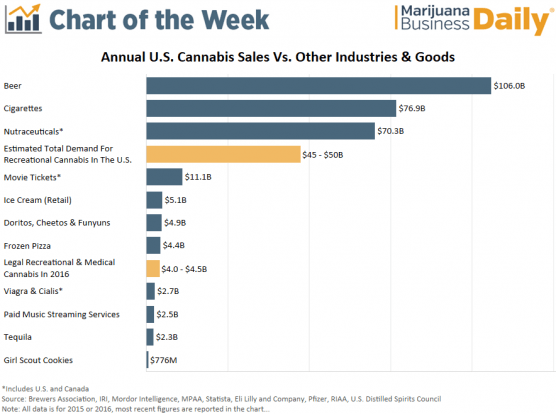 The total annual sales for those sit at $776 million, so cannabis is easily outselling those. Although even though some predicted demand may wane and that the novelty of legally buying weed would wear off, it hasn’t. It has actually been the opposite, though, as sales just keep on growing. With such sales, the industry continues to grow, which has also made more jobs. The report says that the weed industry employs somewhere between 165,000 and 230,000 workers, full and part-time. As the report also says, to put that into perspective, there are now more cannabis workers than there are bakers or massage therapists in the United States. Something that the report also points out is the ripple effect of all these jobs, which sees the employees spending their earnings on living costs, travel and entertainment, helping other local businesses. That includes the real estate boom in spaces that were, for the most part, previously vacant, thanks to the new businesses. The report estimates that for every dollar a consumers spends at a dispensary, another three in economic benefits are created in cities, states and nationwide. That is how many state and local municipalities are plugging holes in their budgets, making use of the cannabis tax receipts. There is an uneasy shadow on the horizon, though, which was the election of Donald Trump. “It is definitely the number one worry for companies,” Walsh said. As the increased enforcement from the Department of Justice would have a significant impact on future sales.